Making quality garment has become prime motto to many garment manufacturing companies. Based on my experience working in the garment manufacturing industry for many years, I have observed that now-a-days export garment manufacturers are more concerned about product quality compared earlier days. While you are working on quality systems, it is very important to know the major factors that affect product quality. Secondly you need to maintain quality of the product what exactly buyer are looking from a supplier. In this article I have emphasized key quality factors that affect product quality in garment manufacturing. Garment manufacturing process involves several processes through which raw material(s) are processed and converted into wearable garments. 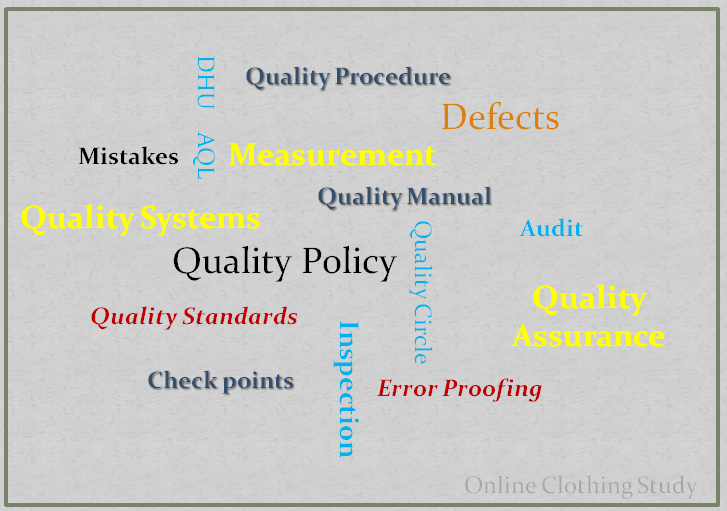 Making quality garment right first time (RFT) depends on number of parameters. Like raw material quality, handling of materials during processing of garments etc. Do you think that quality can be produced by inspection and checking? Through inspection and checking you can only segregate stitched /semi stitched garments as defective garments or accepted garments. To have quality product, quality should be made by the operators who make the garment. 1. Quality Systems: Having quality systems in place plays a major role in producing right quality at the first time. To produce quality product at the end of manufacturing, in each process you have to maintain quality standards. To ensure right quality at the end of the process you can place check point (checkers). Also ensure that each department should not pass defective goods to the next process. 2. Raw material quality: Quality standard of the raw materials to be used for making garment is one of key factors to expect right quality. Like from a defective fabric lot, you can make quality garments. Raw materials quality must be up to the mark (Fabric, Trims and accessories). If required each incoming raw martial need to be checked by qualified checkers. 3. Human factor: Quality systems are run by human. And all machine and equipment and work in done by human. If officers don’t know how to follow quality systems and workers don’t know how to run machine or how to do the given job, factory can’t produce quality garment. Managers need to be qualified enough and operators and helpers must be trained for the job they would do. 4. Delay in Corrective Action: Garment making processes are not yet made error proof. So there is a chance of making mistakes somewhere in the process flow. It is advisable that finding mistakes (defective components) or defective garments earlier stage can reduce the severity of quality issue. Delay in taking corrective action makes the problem bigger that may extend the problem. 5. Communication Gap: A complex supply chain is there to execute complete process. From order receiving to shipment dispatch. Lot of communication happened in between departments and externals parties like suppliers and customers. A wrong information or an incomplete information may make the process worse. Especially when it comes to follow solely buyer’s instruction or requirement. 6. Material Handling:This factor is also very effective. If materials and produced garments are not handled carefully, producing quality garment would be difficult. 7. Housekeeping: Housekeeping and cleanliness of the factory improves quality of the products. This is similar to the material handling. So now you understand what all things need to be taken care of to make quality product. Not only the quality control department but all employees of the factory are responsible following quality procedures. If everyone in the factory work towards making quality garments, nothing can stop them making the best quality product. The secret of producing Right First Time (RFT) quality goods is like following this rule. "Nobody should produce defective garments/work and nobody should accept defectives work/material from other department"